Grand Master Jhoon Lee, who rose to international fame as the most well-known grand master of Taekwondo in the US, will become a professor in a country where he was born and grew up — South Korea. The 73-year-old Taekwondo expert will be appointed as chair professor of Youngsan University in Busan as of Sept. 15, 2004, the university announced Sept. 14, 2004. Rhee has been highly credited both at home and abroad for his contribution in propagating the Korean martial art of Taekwondo in the US and many parts of the world. Rhee, who is currently staying in the US, will arrive in South Korea around the end of September or early October. He is widely respected as the grand master who promoted Taekwondo the most in the US. University said Grand Master Rhee will offer special seminar on Taekwondo three or four times per year. Rhee will be in charge of international exchanges regarding the university's plan for international Taekwondo business. In particular, Jhoon Rhee will serve as a bridge between South Korean and Europe in promoting Taekwondo to the Continent. Around the end of September Youngsan University is expected to form an agreement with British and German Taekwondo association, respectively, for that purport. Jhoon Rhee will also participate in a project to set up "World Taekwondo Park" in Busan. A native of Asan in South Chungchoeong Province he moved to American in 1959. The world-renowned holder of 10th degree black belt soon became to be known as "the Father of American Taekwondo." In 1960s Grand Master Jhoon Rhee befriended the legendary Kungfu star Bruce Lee. 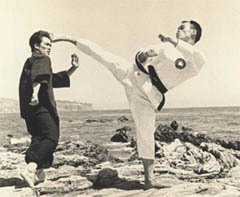 He taught Bruce Lee Taekwondo kicking whereas he learned from the greatest martial artist-movie star how to use hands. He was appointed to National Council on Vocational Education in 1984 by President Ronald Reagan for a four-year term. In 1988 he was also appointed as special advisor to the President's Council on Physical Fitness & Sports by President George H. W. Bush. 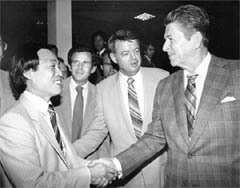 Jhoon Rhee's high-profile students included Muhammad Ali, Jack Anderson, George Allen Sr., Bob Livingston, Tony Robbins, Jack Valenti and over 300 US Senators and House Representatives. Jhoon Rhee has over 60 affiliated Taekwondo studios in the US and 65 in the CIS (former Soviet Union) countries. Grand Master Jhoon Rhee vies with Bruce Lee, the legendary Kungfu star in 1968. 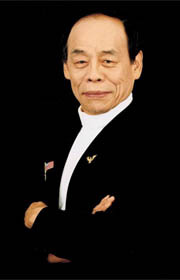 Jhoon Rhee's numerous awards include American Immigrant's Achievement Award (1999), and NAPMA's Life Time Achievement Award (1999). In the year 2000, he became the only Korean-American who made one of 203 most recognized American immigrants by the National Immigrant Forum and the US Immigration and Naturalization Services (INS). Among the 203 honorees were Albert Einstein and Alexander Graham Bell.